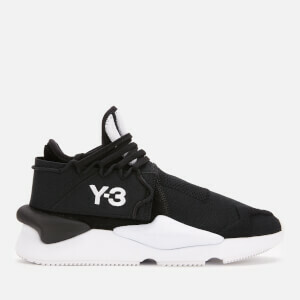 Black ‘Reberu’ trainers by Y-3, Adidas’ collaboration range with Japanese designer Yohji Yamamoto. 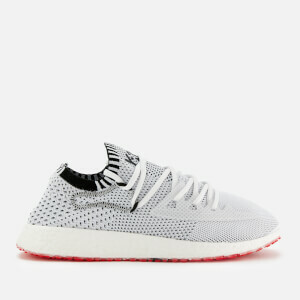 With an innovative design that merges the minimalist hallmarks of the label with Boost cushioning for maximum comfort, the low-tops boast flexible, knitted sock-style uppers with hints of synthetic tonal leather. 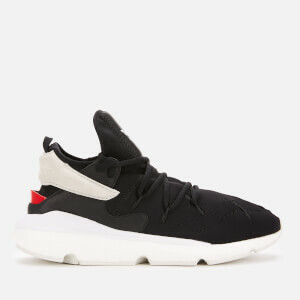 The slip-on sneakers are set upon chunky and spongy midsoles that offer responsive cushioning with each step, and textured rubber overlays provide enhanced grip. Concealed padding on the back of the heel offers a snug and supportive fit. 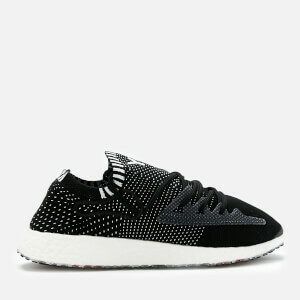 Complete with tonal embroidered logo on the outer side of the tongue, a branded faux leather tab and the designer’s signature stitched on the toe in contrast yarn.